Last year’s release of the theatrical adaptation of the A-Team gave me some decent figures of the team and a van to boot. (Still need to post a review of those too!) Now the folks at Diamond Select Toys are helping me to fill in some other gaps. I loved the BTTF films back in the day. The twisting and overlapping plot line of Marty’s family life always held my attention but one of the real stars of the film was the Delorean. Doc Brown said it best: “If you’re going to make time machine out of a car you might as well do it with some style!” My favorite version? The hover-conversion model from the beginning of Back to the Future 2. It took the awesomeness of the Delorean, tossed on a “Mr. Fusion” home reactor, and gave us a hover conversion! Seriously– what’s not to like about that? 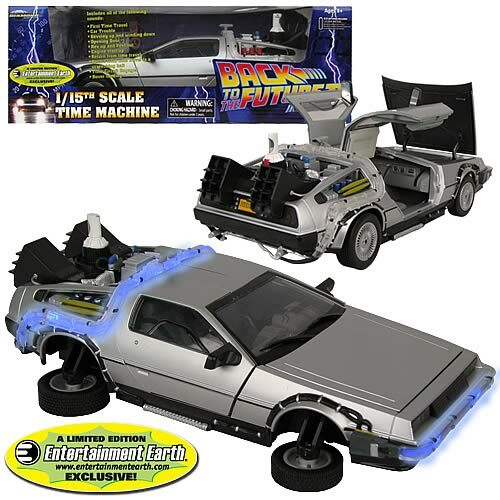 Well, along came Diamond with their BTTF line and VOILA! A 1:15 scale toy that will seat G.I. Joe/Star Wars/1:18 scale figures!! Imagine the possibilities– now that 25th Anniversary Matt Trakker figure has a ride of his own!